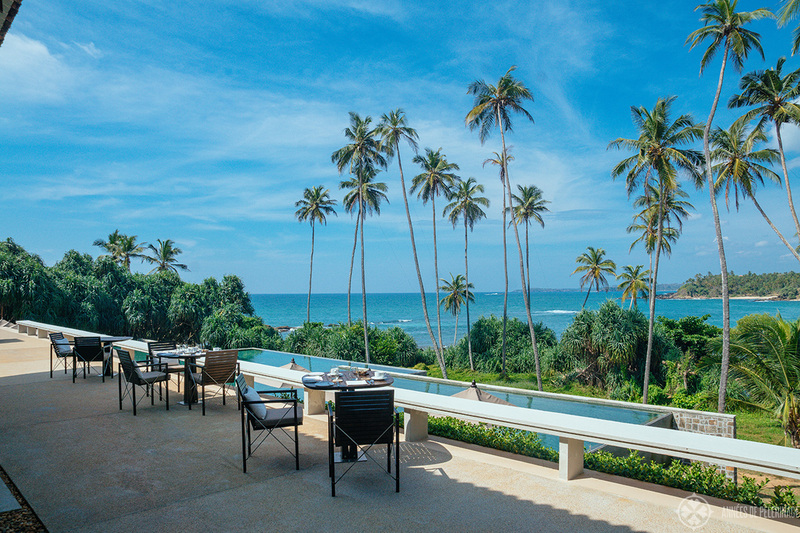 An honest AMANWELLA review - The best luxury hotel in Sri Lanka? 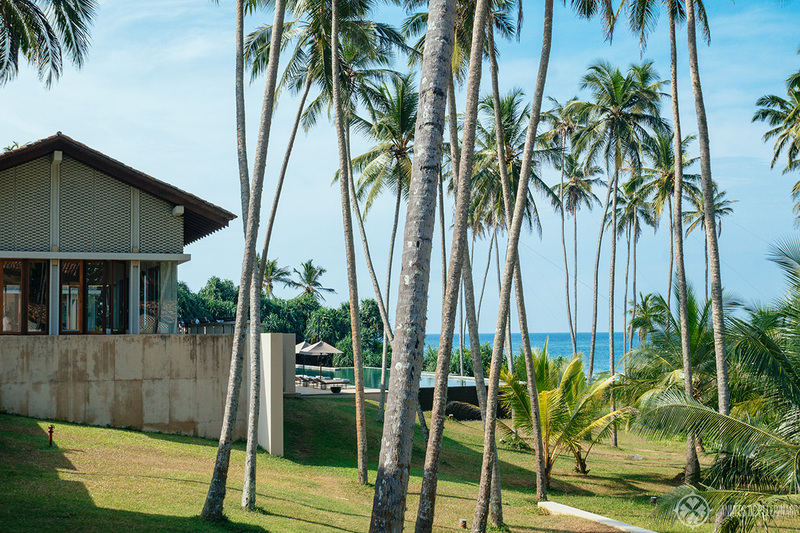 Home Luxury Hotel Reviews Amanwella review – the best luxury hotel in Sri Lanka? 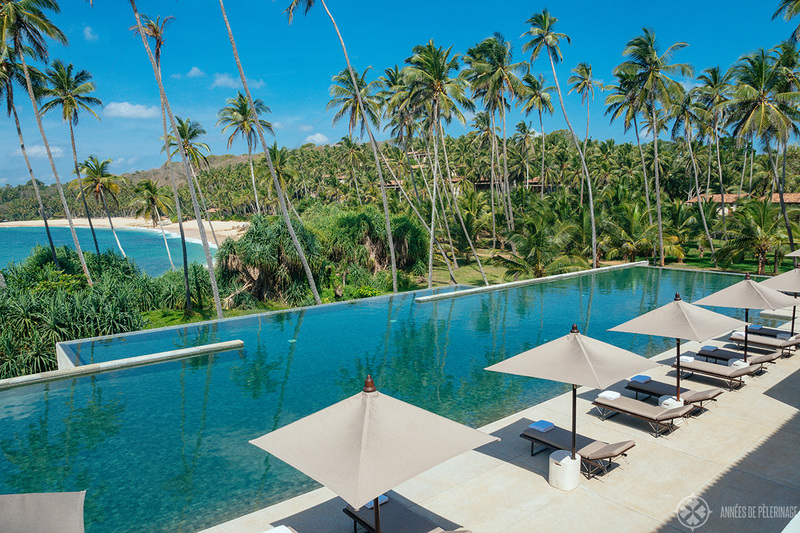 How do a picture-perfect beach, a gigantic infinity pool, coconut palms galore, and serene villas with a private pool sound like? Just what you were looking for? 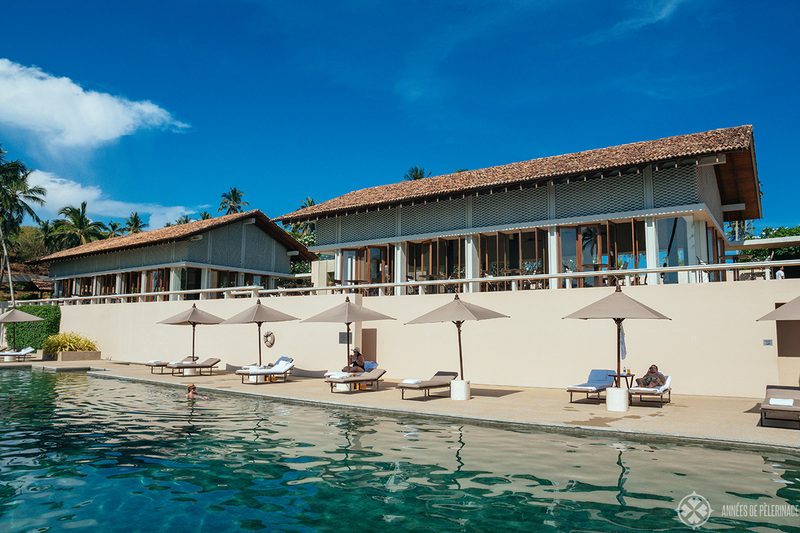 Well then, you are in for a treat: Amanwella, the best luxury hotels in Tangalle, offers you just that in copious amounts. 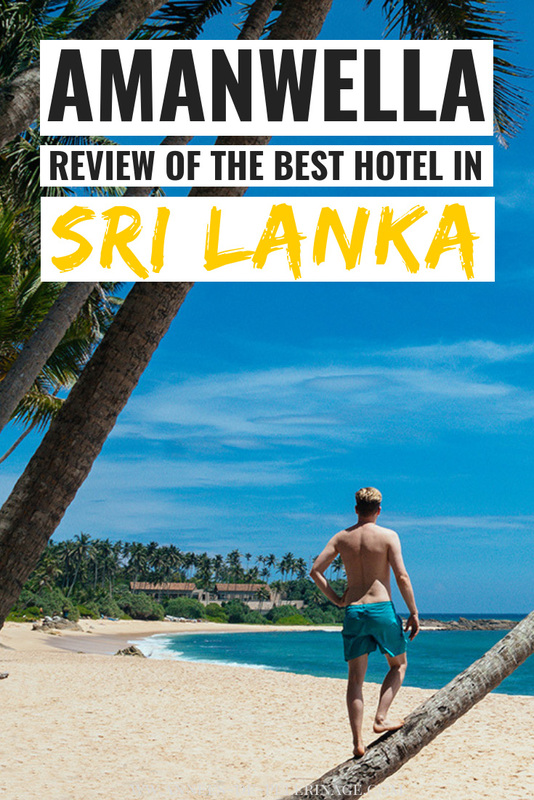 I stayed at the fantastic luxury resort for 5 nights (make sure to explore the rest of my Sri Lanka itinerary here; I stayed at Amangalla as well) and this is my review! As usual, my stay was entirely self-paid and I’ll share the good and the bad with you. 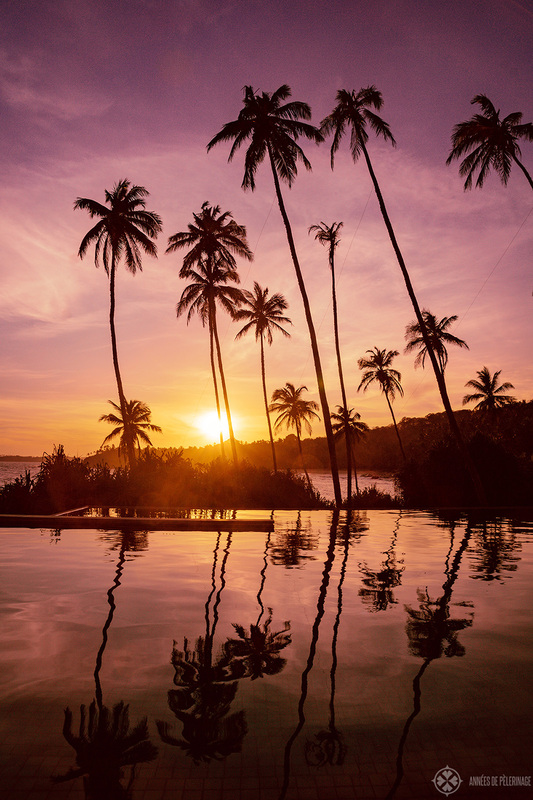 Imagine, centenarian coconut trees swaying in the wind, the steady beat of frothing waves crashing into the surf and a languid atmosphere only occasionally disturbed by a tuk-tuk driving straw-hatted guests to enjoy a sunset cocktail – this and so much more is Amanwella. 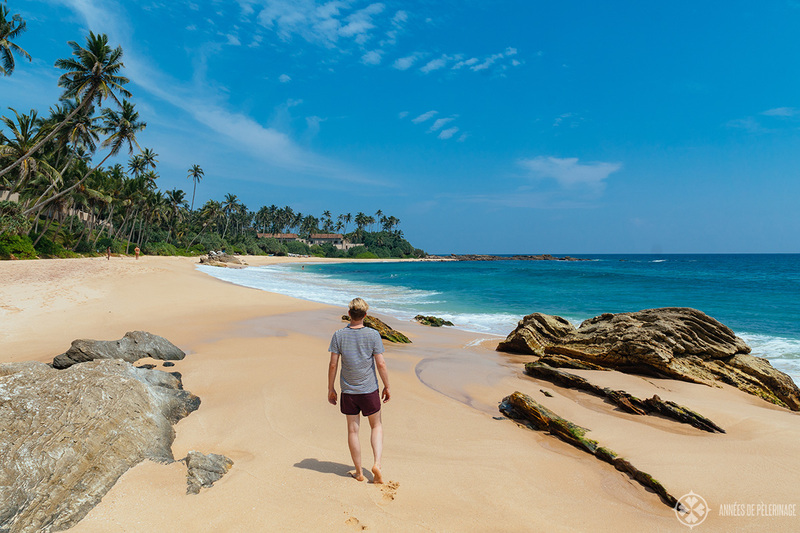 I guess, what draws most people to this outstanding Aman property is the near perfect crescent-shaped blond beach on Sri Lanka’s south coast stretching for almost a kilometer. And who could fault them. 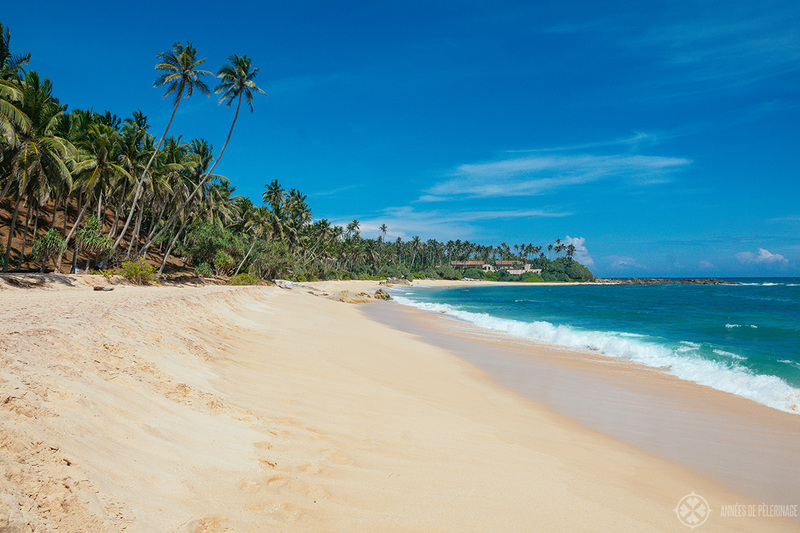 Even I am hard pressed to name more than 10 more beautiful beaches on this planet (that aren’t swamped with tourists). 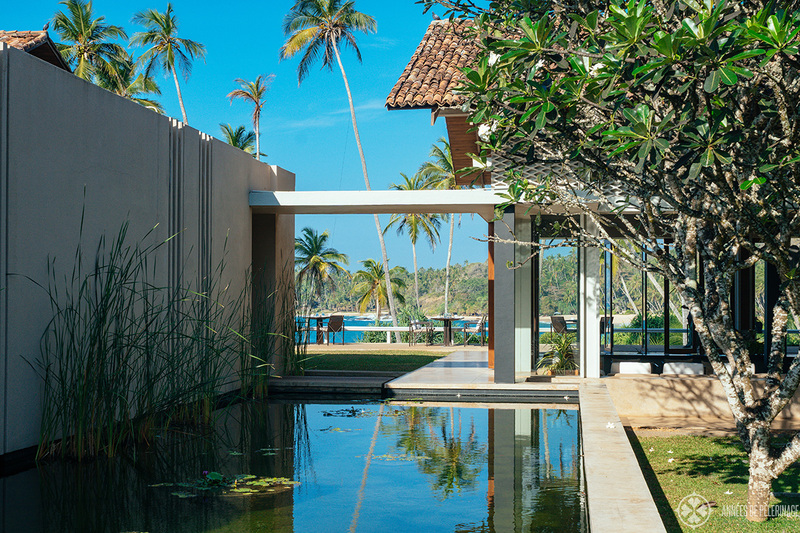 Add some Geoffrey Bawa inspired architecture, 30 private villas and you got the makings for a perfect vacation. 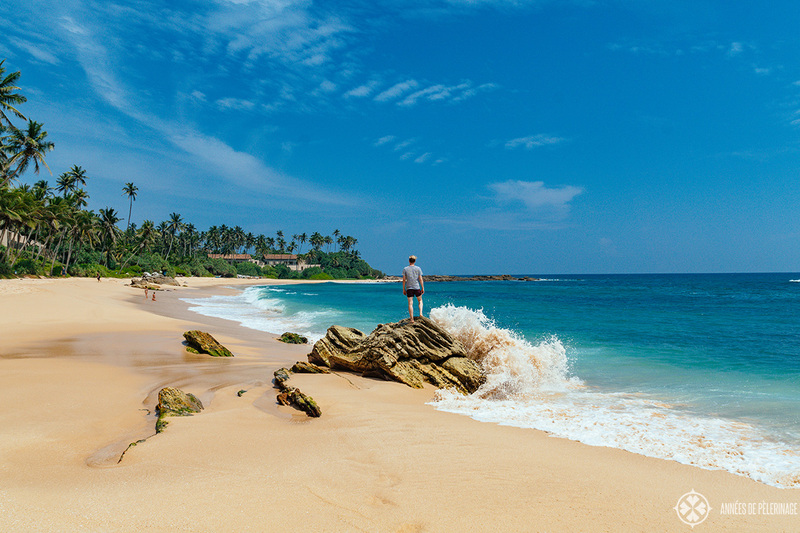 It takes 3-4 hours from Colombo to Amanwella where you’ll find the quaint little fishing town of Tangalle – with only one hotel worth its name in the wider vicinity. The property is fairly large, so large in fact that aforementioned tuk-tuks drive guests from their villas to the beach or to dinner (though everything is still in walkable distances). 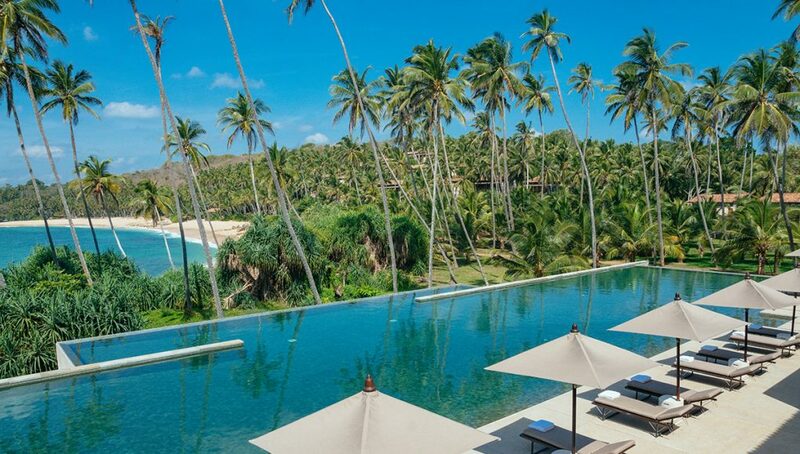 While not entirely new, Amanwella opened in 2005, still looks pristine and recently (end of 2018) underwent a change in management. The new manager, Pantelis Korovilas, seems quite devoted to bringing the luxury resort up to the present standards and I got the impression he is up for the task. But what would an honest Amanwella review be without mentioning that there is indeed a task? More on that later, though. 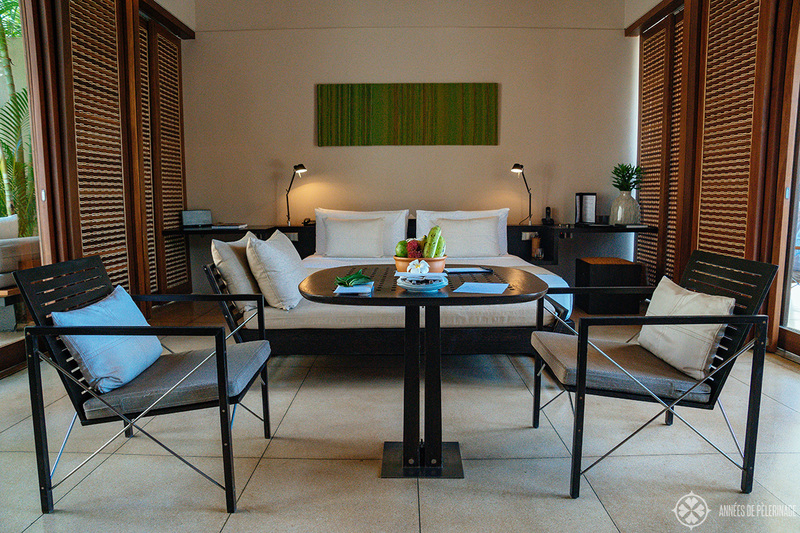 Frequent visitors of Aman resorts might be surprised (yes, talking about you #amanjunkies) to hear that there is in fact only one basic room category at Amanwella. All villas share the same floor plan. The only premium you have to pay for is the view. You may choose between a garden view, partial ocean view, and oceanfront. 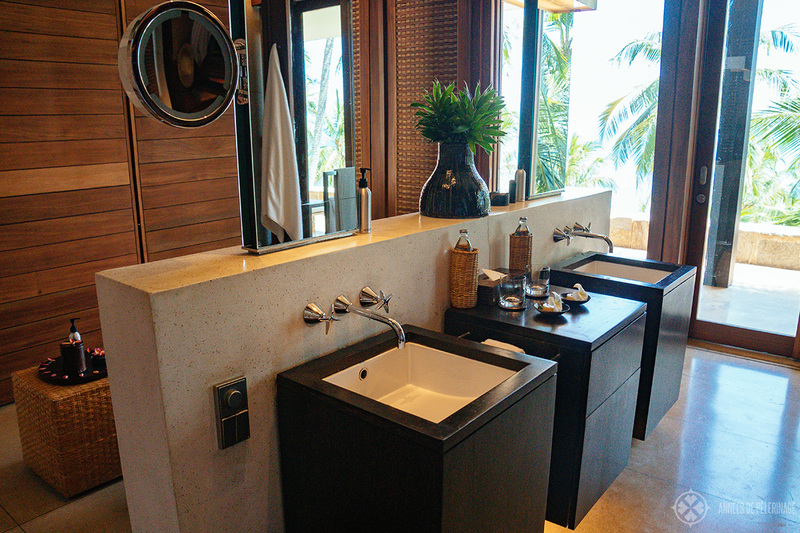 As I stayed 5 nights and wanted some relaxing privacy on the huge open terrace, I opted for the oceanfront villa (officially just called ‘Ocean Pool Suite’), though I felt the premium of around 200 USD per night was taxing the limits for this room category quite a bit. I do have to say, however, that waking up to the view of that perfect beach was indeed quite special. On my next visit, I would probably take the garden view as I didn’t end up spending all that much time in the room after all. So, let’s talk a bit about the layout of the villas. 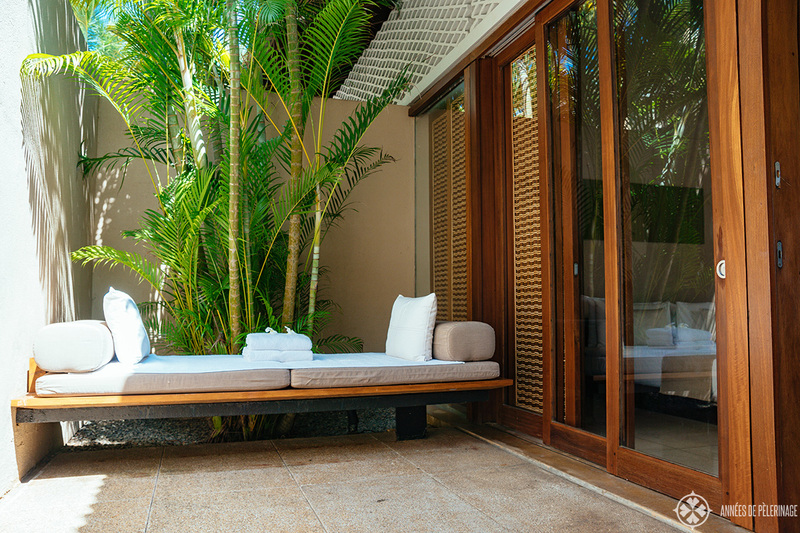 In lieu of a reception area, the villas at Amanwella surprise you with a spacious private pool and a little sitting area. Beyond the floor to ceiling windows lies your little self-contained vacation retreat. Only wide-open sliding doors & windows separate the different sections of the villa. Together with the high walls on the outside, this creates a fascinating contrast between privacy and a lofty openness to the sounds of nature. All that indirect sunlight makes it feel like waking up from a dream, only to realize it’s real. 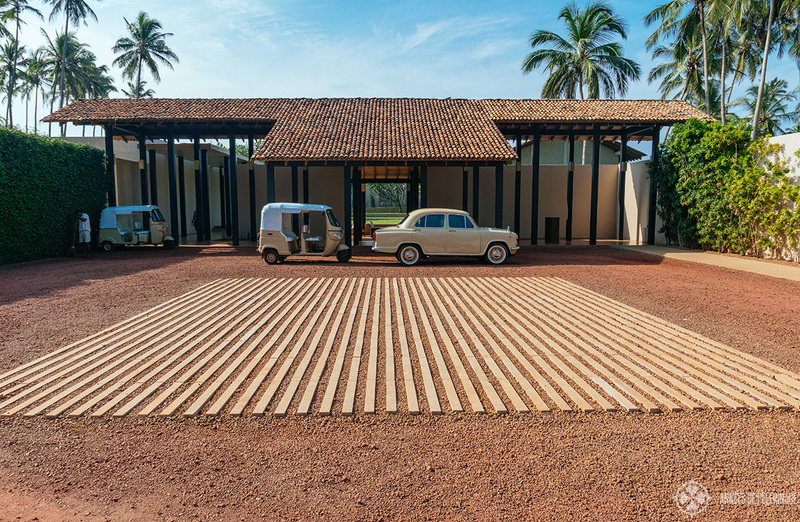 The interior design is immediately recognizable as an Aman: reduced lines, an oh so light, but subtle Sri Lankan touch, but never austere. When I say Sri Lankan touch I’m not talking about coconut shells, cinnamon bark, and pictures of elephants, but more the way the general layout quotes traditional Sri Lankan homes. 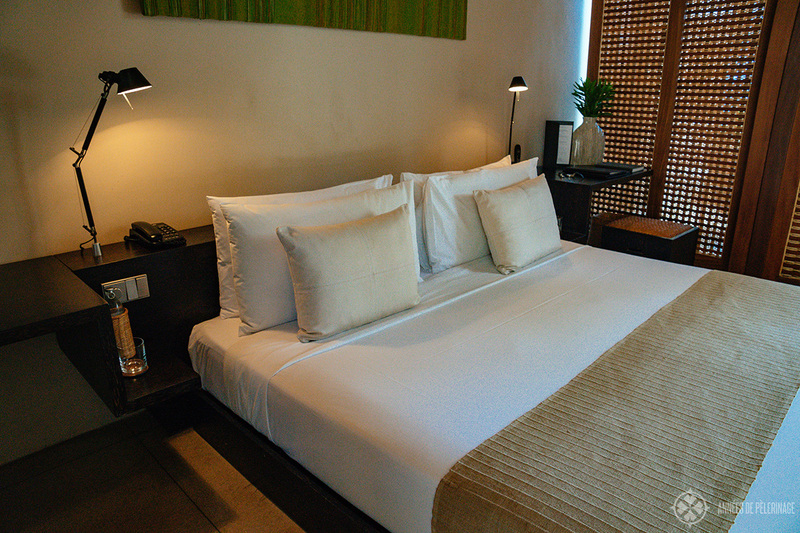 The spacious sleeping and living area is separated from the bathroom by a gigantic sliding door. 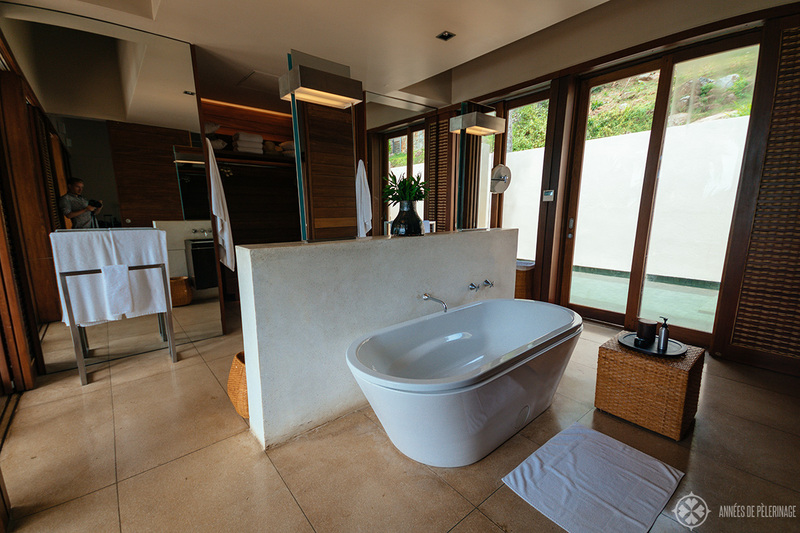 A lovely bath-tub and his and her sinks are nestled in between the walls – only the shower and the toilet offer the sometimes needed privacy (tucked away to the left and right on the picture above, right behind the mirrors). 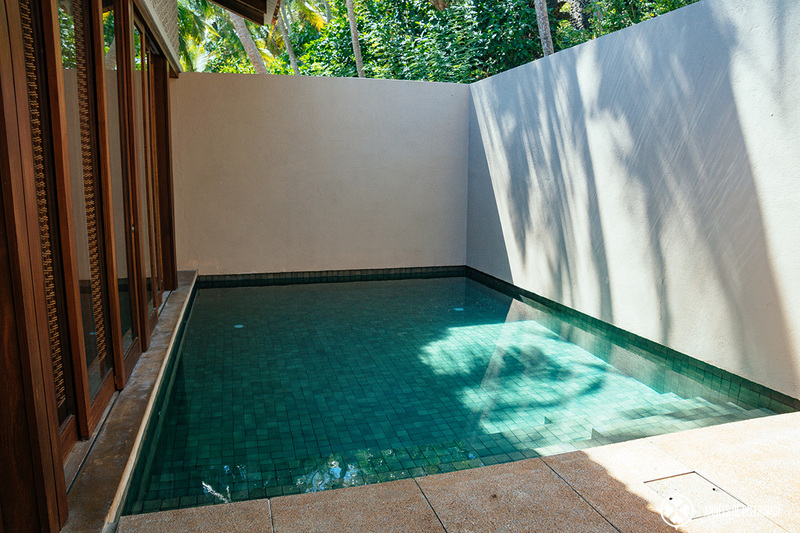 The suites are about 70 square meters / 750 square foot large (together with pool and terrace that makes around 100m²). Truth be told, they didn’t feel overly spacious, but utterly not cramped either. I loved the overly large bed (probably around like 2,20 meters wide) and the little recamiere, where I retreated when the terrace was too hot. 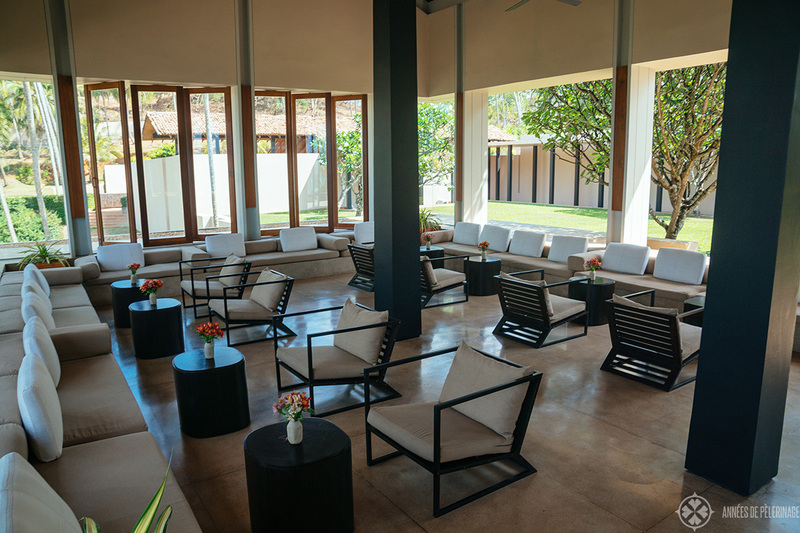 The highlight of the room is probably said huge terrace, where you’ll find two sun loungers and a table to enjoy your breakfast or a light lunch. The terrace is so big that the back half of it remains unused (other than offering a nice view from your toilet seat) – quite the luxury, eh? So, here’s the bad: All in all the villa felt a bit like beautiful on the outside nobody ever truly used before. 1. The pool was mostly too cold, quite shallow (like 1 meter) and usually dirty (lot’s of insects) and didn’t offer a view of anything. I think I used it three times during my stay, mostly because I paid for it and not so much because it was all that inviting. A proper filtering system would have greatly increased usability, as would a direct view of the ocean. Then again, I guess there are some guests that might enjoy the utter privacy of a pool with undecorated concrete walls on all four sides. I don’t seem to be one of them. The pools at Amanjena in Morroco didn’t offer a view either, but they felt quite a bit better integrated into the whole concept of the room. 2. There is no true closet and only four drawers. The dressing area between toilet and shower was definitely not big enough to store (and open) two big suitcases and I would have wished for a bit more storing space. 3. The Sri Lankan sun can be quite intense. An umbrella would have greatly added to the usability of the beautiful terrace. 4. 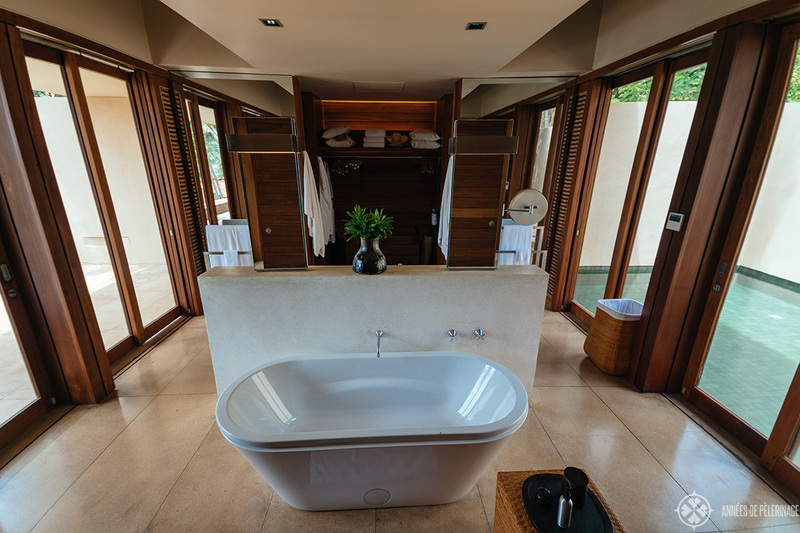 There is no bidet and the toilet doesn’t offer the shower function almost all toilets in Sri Lanka have equipped. I once tried to use the bathtub, but due to the tiny faucet, it took over 30 minutes to fill the water. Adding towels, and some soap on the stand next to it wouldn’t inconvenience the occasional bather. I also tried to listen to some music while I took my bath, but that Bose sound station from the last century only offers sockets for an iPhone 1. Great! 5. The complimentary mini bar is quite an austere affair, with standard sodas and not much variety in between. There is no coffee machine, and only one kind of tea (which was quite good, though). 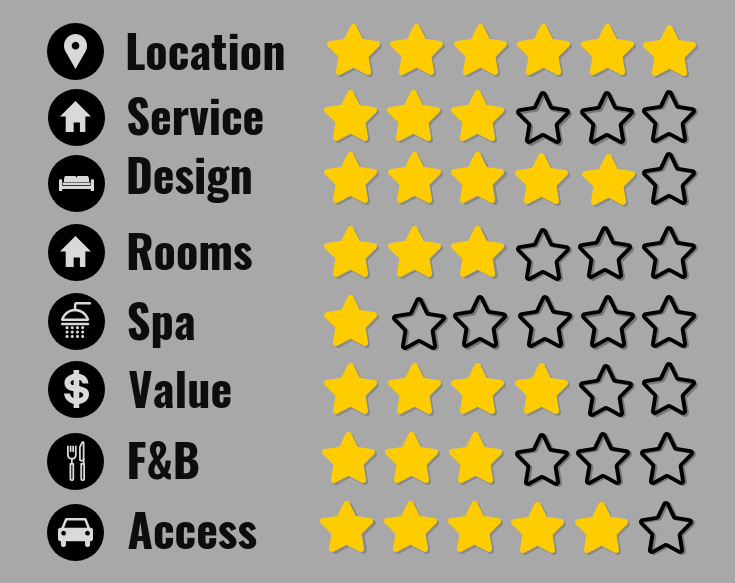 Sadly, I have seen three-star hotels better equipped. The hotel manager said they are still trying to source a new service partner for the coffee machines, as the old ones produced undrinkable murk. I am not sure how understanding 90% of the guests are when it comes to such basic necessities. 6. I’d like to point out, that the bath products were extraordinarily bad and I regretted not bringing my own conditioner (a basic necessity to treat long hair after a swim in the ocean). Apparently, the high import taxes prevent them from offering the usual Aman skincare, but again I’d like to point out that all other luxury hotels I stayed at in Sri Lanka managed to find a way around that problem. 7. We also had an unusual amount of insects in our room. While I am aware that we are in tropical Sri Lanka, and I’m not somebody to fuss over a gecko, there wasn’t a single night we didn’t have a couple of crawly things between the actual sheets of our bed. As the huge sliding doors don’t close the room completely (there are some huge gaps between the floor). Even the best housekeeping probably can’t solve that problem. 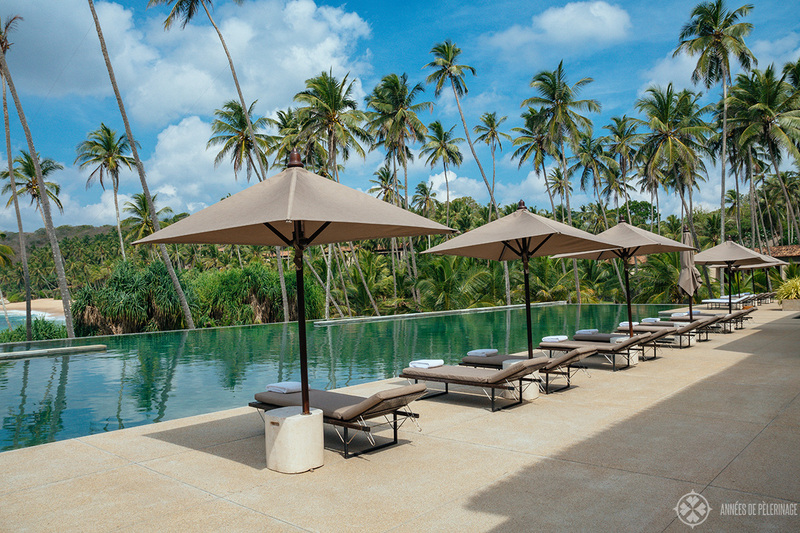 In a nutshell: The villas at Amanwella itself are beautiful, and saying anything else would be an outrageous lie. But all in all, things just didn’t add up. Sorry, for the little rant, but I felt these things had to be addressed. As I don’t want you to get the impression I’m a little pampered queen looking for a fly in the ointment or someone who can’t enjoy even the most beautiful luxury hotels, let’s talk about the stunning beach! I already mentioned that that coconut lined stretch of perfection in front of Amanwella is out of this world. 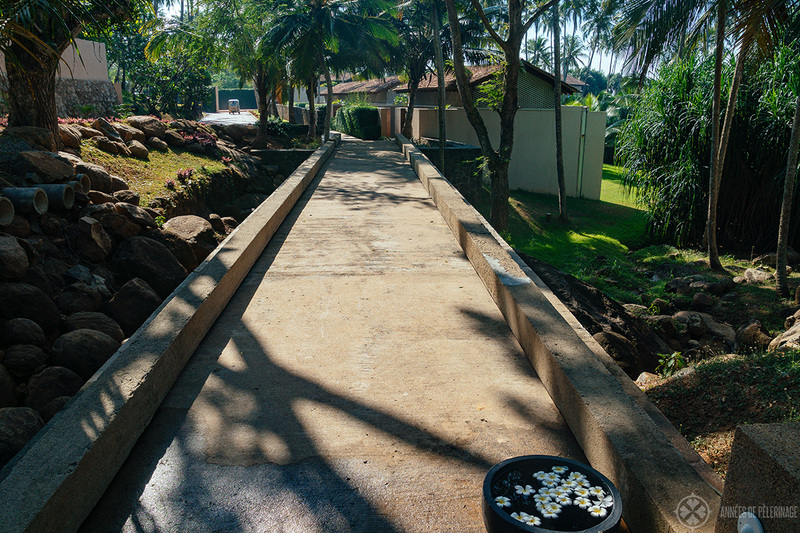 A winding little concrete path of probably 800 meters leads from the lobby further down to the beach club. It almost makes you feel like walking through a village. 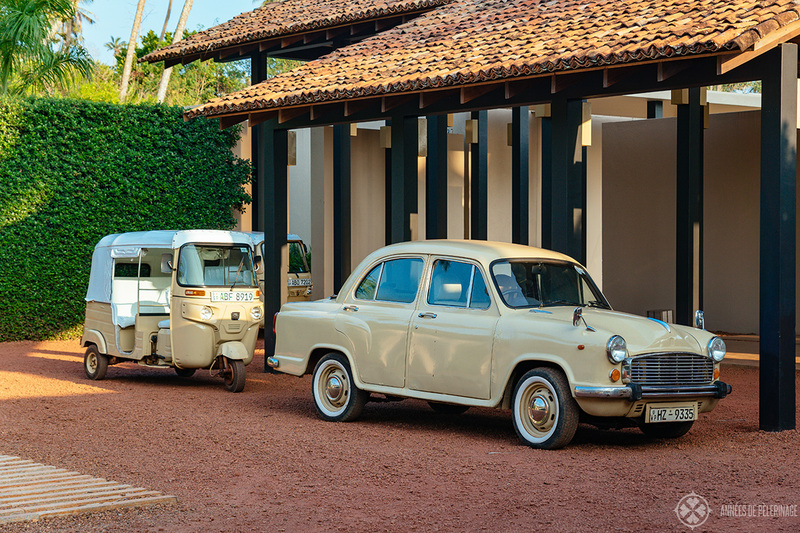 If that sounds too much for you, the friendly staff at the lobby will gladly drive you down with an Aman tuk-tuk. 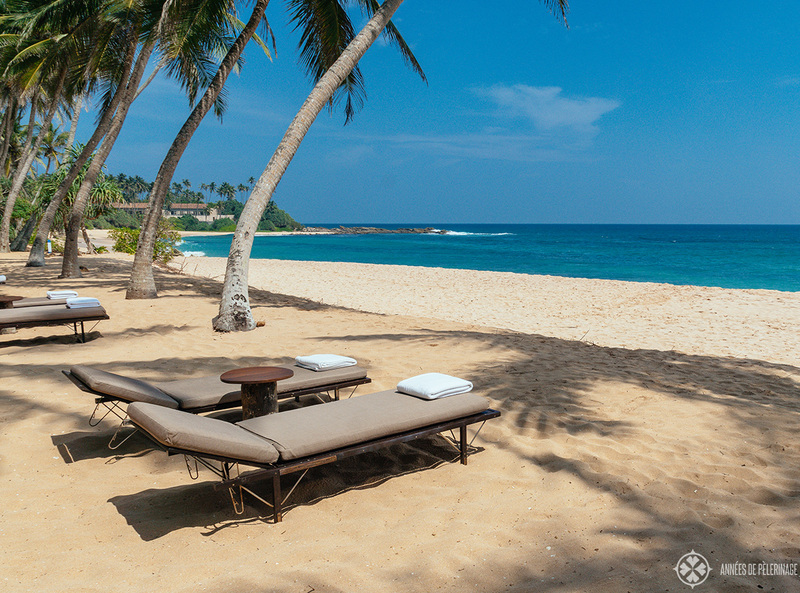 The sun loungers at the beach club are nestled under the palm trees, so no umbrellas are needed. A dedicated staff of beach boys helps you setting up your little domain for the day while offering complimentary refreshments (water, fresh juices, etc.) without you ever asking. They also double function as lifeguards. 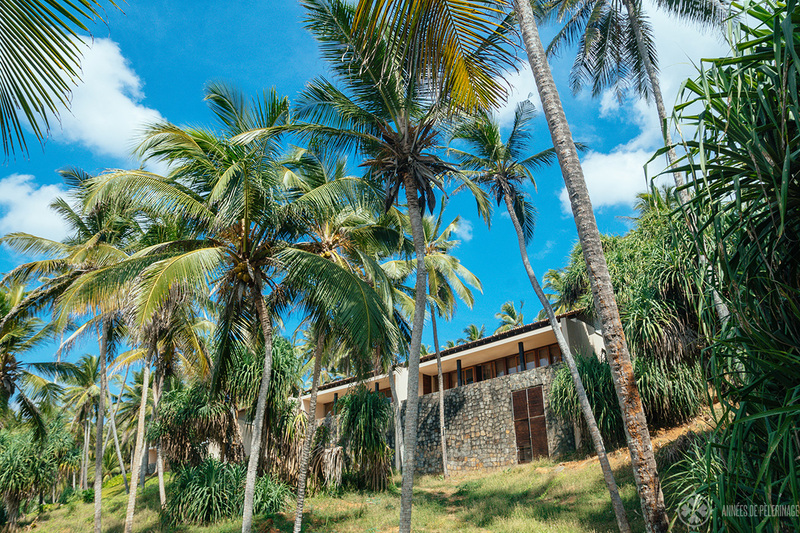 Amanwella calls this place the coconut grove and it is indeed quite a special place. Sun loungers are perfectly spaced for privacy, though not exactly the widest I ever had. Some options for couples, maybe even a little beach hut would benefit the overall quality. While there are showers at the beach club, seemingly nobody ever thought of providing towels near them, nor shampoo, conditioner and after sun lotion for that matter. Also, possible beach activities could be promoted better. I only noticed that there are volleyballs and badminton rackets available for free on the third day by asking. Uh well. 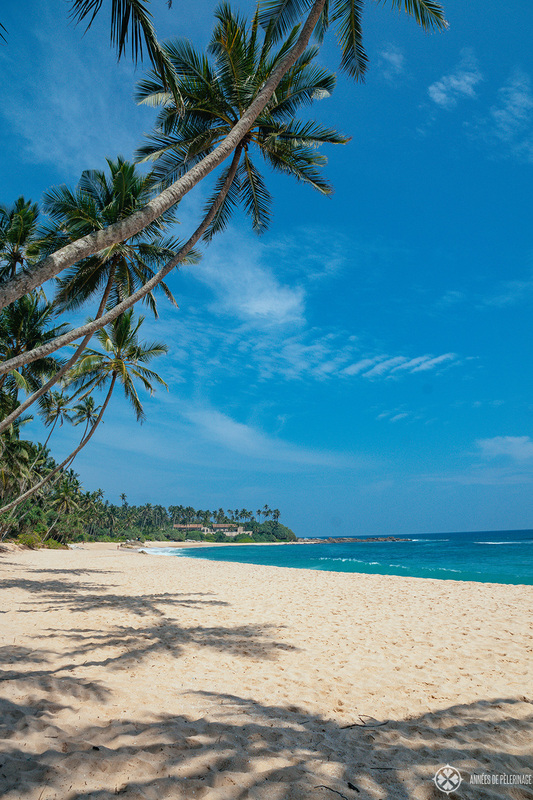 I would also like to point out that the stunning beach in front of the hotel is a public beach (like all beach areas in Sri Lanka are by law). While only hotel guest may enter the beach club or the adjacent restaurant, the immediate sand is open to all. It’s not a crowded place, all in all, but not empty either. We frequently had tourists lounging in the sand mere 10 meters away, and ever so often had some walking past. I felt perfectly safe and found Sri Lanka to be very safe in general. 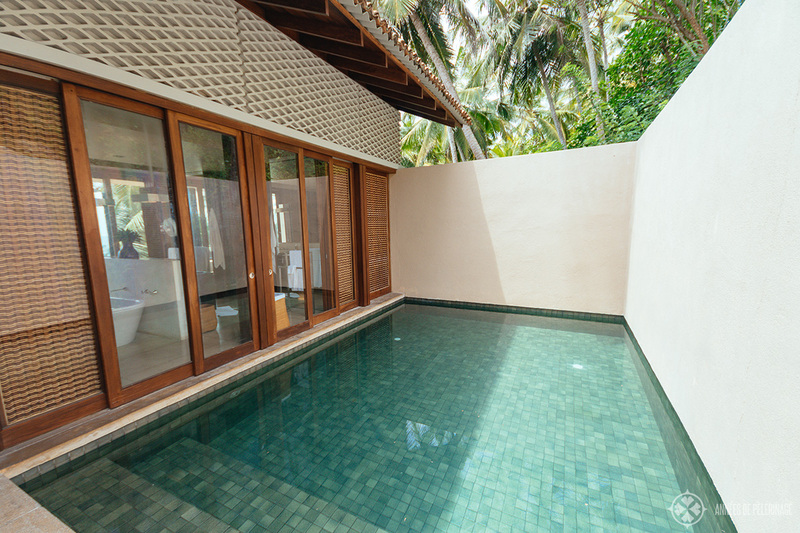 If you are looking for utter privacy, you have to stick to your villa or the main pool. It only got loud once, but those apparently were some relatives of one of the senior staff members. The manager only commented: “It’s complicated”. You should also know that the Indian Ocean can be quite rough. It’s not that easy to get into the water, especially when a large wave is crashing into the surf, but once you made it, it feels a bit like in an amusement park. I loved it, but I’d also like to point out that it’s not suitable for small children or physically limited people. Again, the pool will be your alternative. That main pool is quite fantastic, to say the least. It’s not only the perfect spot to observe a romantic sunset, but also incredibly big. I’d guess it’s around 50 meters wide and 20 deep. 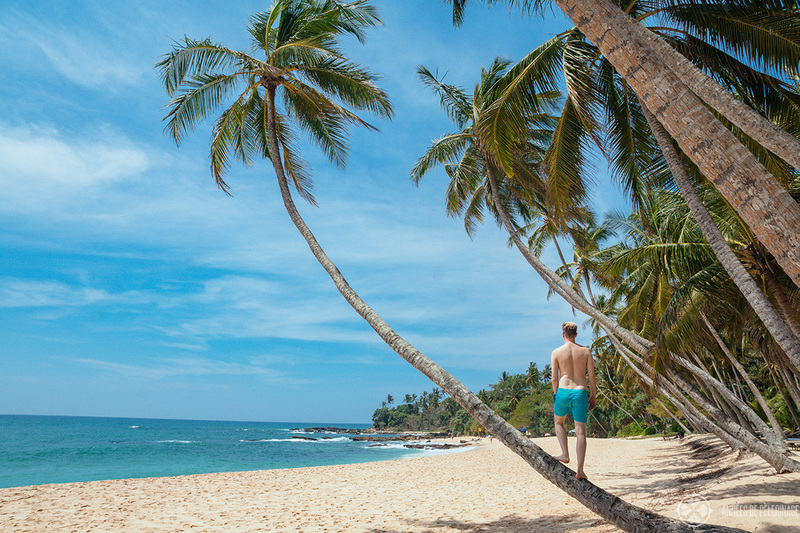 As most people will stick to the beach, chances are quite high you’ll have it all to yourself. 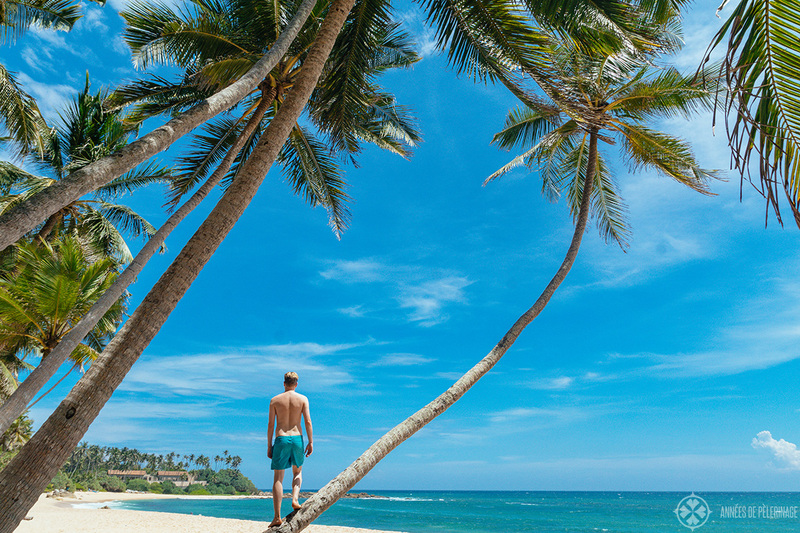 I absolutely loved these mighty coconut trees shading the green-blue water. The hotel manager informed us that most of these trees are probably 80 to 100 years old. Truly stunning! There is no dedicated pool for children, but big portions of the pool are quite shallow (it gets deeper the farther in you go), so I believe this will be no problem. I experienced the service at the pool as quite attentive and it’s definitely a very good place to hang out – if a bit hot around noon. 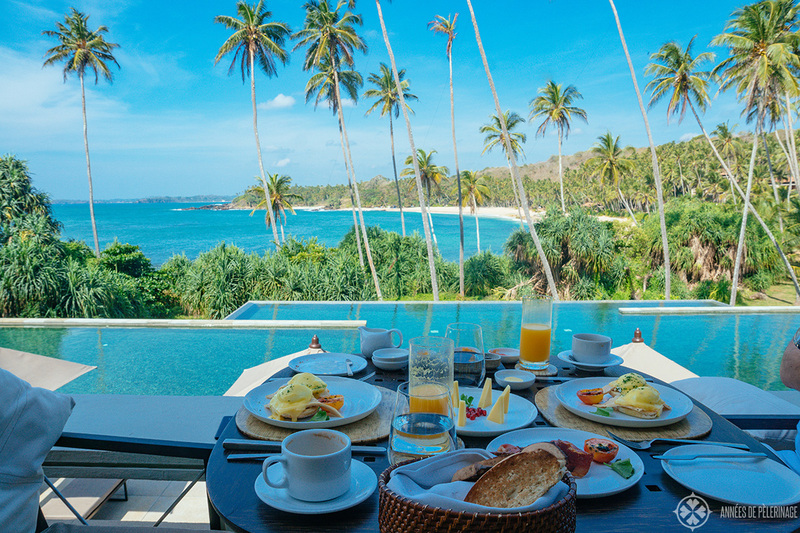 Like many other Aman resorts, Amanwella only has one main restaurant where breakfast and dinner are served. Perched above the pool and with an excellent view of the palm-lined cove, it is indeed the sweetest spot of the property. 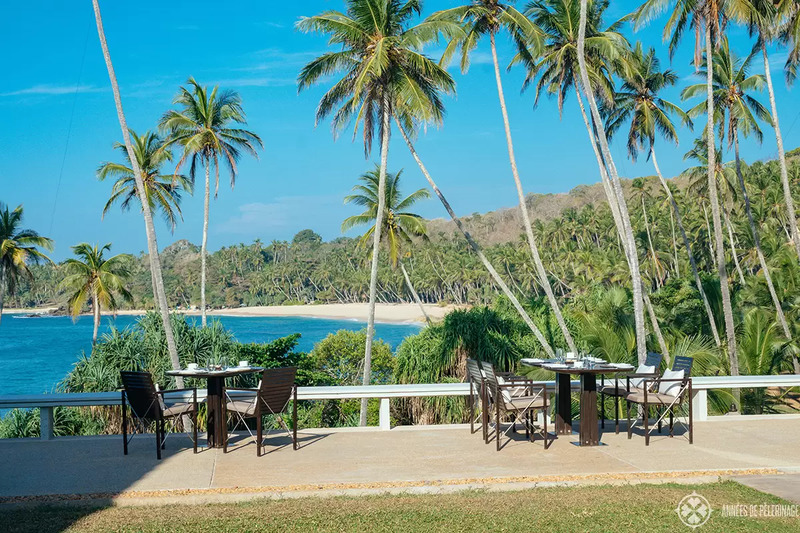 You can also opt to have breakfast in your room or eat lunch or dinner at the beach restaurants, but given the fantastic view, it almost feels like a crime to do so more than once. I think it pays off to book a rate where breakfast is included, otherwise, you can expect to pay around 40$ per person for a hearty breakfast. 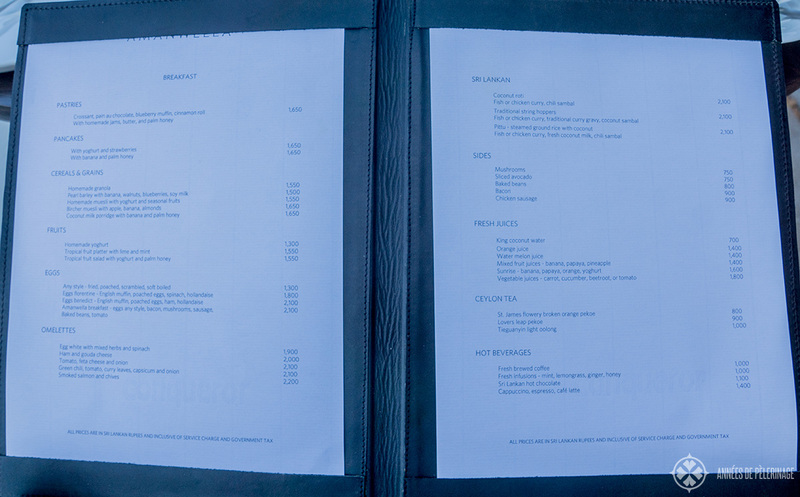 The breakfast menu is rather sparse (see below) with no dedicated egg specialties other than the one local variety – at least compared with other Aman resorts. All common main staples of breakfast, like omelets, granola, fruits, etc are available in acceptable quality, though. It usually took around 15 to 30 minutes for the first items of our orders to arrive, so you’ll have to calculate more than an hour for breakfast to be on the safe side. That being said, the bread and pastries were good, while most of the other items fell short on their promise of excellence, especially the eggs in all their variants (eggs benedicts with overly thick slabs of turkey ham, c’mon). The fresh juices usually tasted like they had been diluted with water (melted ice cubes?) while the hot chocolate was undrinkable and the coffee a good standard. The pancakes were lovely, while the granola and fresh fruit were usually a mixed affair, and I have seen better presentations as well. All in all, I’d wished for a bit more variety, as I truly didn’t know what to order on our last days. A special egg of the day or something along the line would have greatly improved my personal experience (Amankila in Bali did a great job here!). I mean, it’s a beach resort, so the menu should be created around the premise of people staying a week. Dinner at the main restaurant was equally mixed. 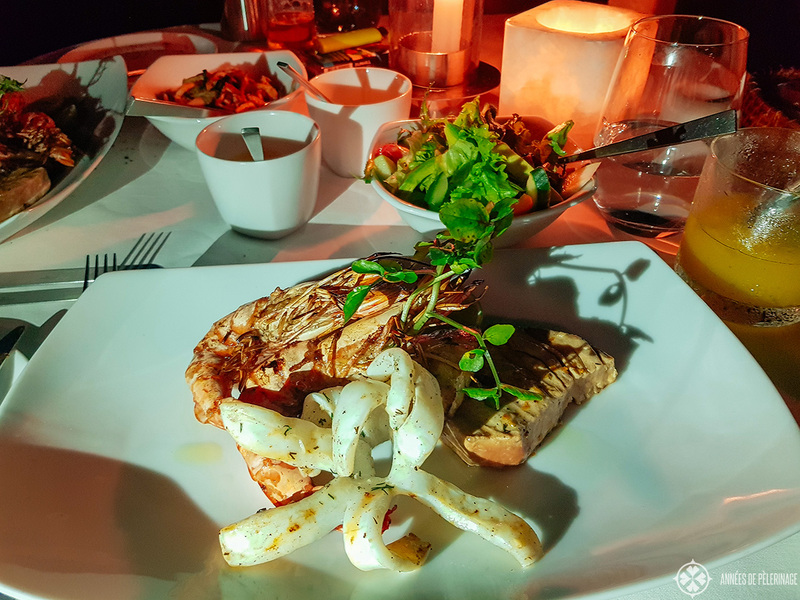 A single candle was never enough to actually see what you were eating, though it did create a tranquil and romantic atmosphere. Most of the western meals I order were good, but when lacking the prevalent curry aromas of Sri Lanka a bit too bland. It’s a lovely restaurant all in all, but nothing I’d ever want to recommend a friend, despite the live music every evening. I do have to mention, however, that I am unable to eat even mildly spicy food, so I was never able to try the daily Sri Lankan special menu. The service was equally mixed, with the head waiter seemingly the only person with a true understanding of the subtleties of fine dining. A bread basked simply shouldn’t take 20 minutes to arrive. On the first evening, you’ll probably not even notice that tardiness, as you are utterly bedazzled by the view, but it grew a bit tedious throughout my stay. I’d recommend an amuse bouche that is ready to be served as soon as the guests arrive. Also, a lot of orders where misunderstood, which usually lead to some awkwardness that could have been remedied by simply asking. There is another restaurant on the beach, which is considerably smaller and can only serve 6 tables at dinner. It’s a lovely spot, with torches lighting the way. They only serve fish and seafood from the grill, but most of what I ate here was quite lovely. 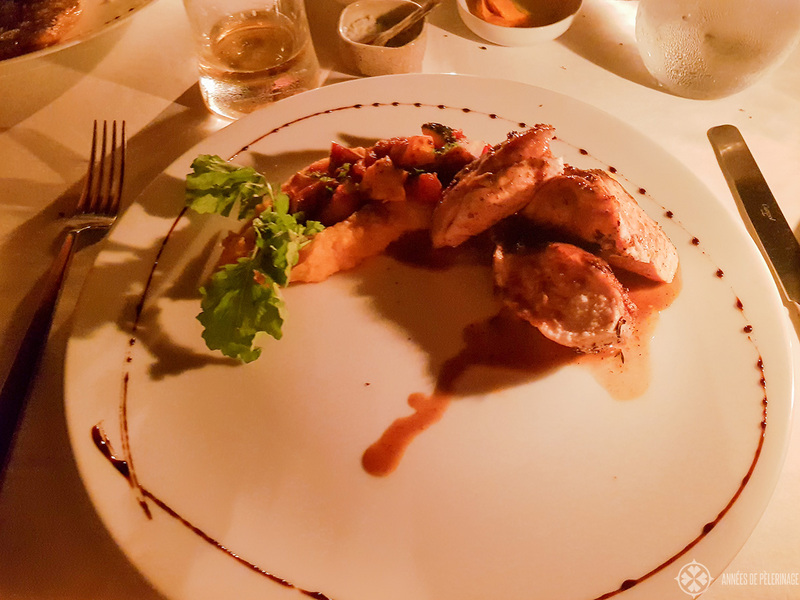 While the concept of a medium-rare tuna steak was beyond them, the local fish had been downright amazing and something I would happily order again and again. Appetizers, bread, and starters also were way better than anything served at the main restaurant. Amanwella also offers a complimentary afternoon tea, though it is no grand affair, with a few local nibbles and a couple of herbal infusions to choose from. Nothing you would miss, but probably something to stop by on your way to enjoy the sunset. Right next to the restaurant you’ll also find a lovely bar which shares the same terrace overlooking the majestic bay. I wouldn’t think of it as a cocktail bar, but more of another place to enjoy some drinks before or after dinner. Most of the cocktails I tried were definitely not up to its price (around 10 – 15 USD), and serving a Martini in a long drink glass was certainly a novelty as well. I loved how one of the waiters was very open about the fact it was his first day (it takes some guts to say the truth, and at the end it’s the only way to solve a problem), but it still gives you a good impression of the F&B-service. 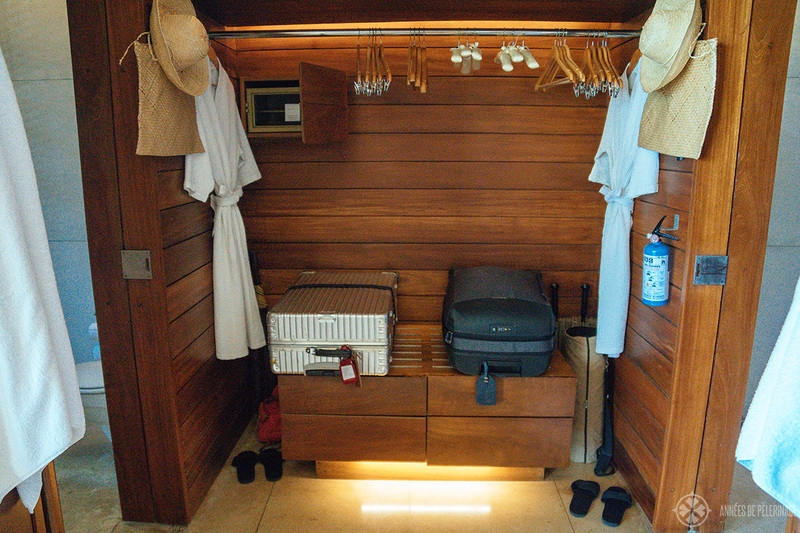 Housekeeping at Amanwella was always spotless and perfect, with minimal intrusions, if any. I was indeed quite impressed. They did work like a clockwork or invisible fairies and we always returned to a near perfect room – no matter when we decided to return from breakfast or dinner (I already mentioned the insect & Gekko problem). Service at the restaurant was, as indicated above, usually a bit lackluster on the verge of tardy, and the kitchen usually downright sluggish (it felt like they only had one cook). Most of the waiters had smaller problems with understanding our orders which often resulted in unexpected results. A lot of them often lurked around, like they were unsure how to busy themselves. Our guest assistant and the assistant management were extremely disinterested and sloppy – definitely not up to Aman standards. It never felt like they genuinely wanted to help you. Unlike the manager of the property, who was an extremely friendly, likable and yet professional soul down to his core. When I mentioned my recent sunburn at one of the many short little talks at the dinner table, he even sent some fresh aloe vera to my room. Such a lovely touch! All in all the service was okayish, but it had the feeling it was hard to source good and experienced staff in the vicinity. At a 4-star property I’d probably have called the service enchanting, but for an Aman, it was way below average and definitely needs some refining by some good international coaches. I’m not sure I was addressed by name even once throughout my stay. I gotta mention, however, that the one safari I did to Bundala National Park (read more about the best Sri Lanka Safaris here) was quite lovely and well organized. Not perfect, but hard to criticize. 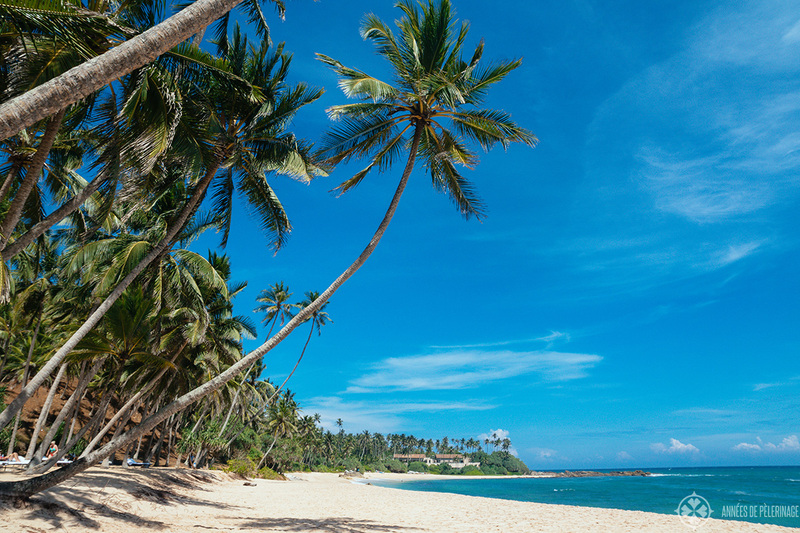 My transfer to Amangalla in Galle (read my guide) went quite smooth as well. Still, it’s like the moment you set foot into the hotel it felt like something is missing, you can’t really place. It’s not the fact that there is no real spa or no gym (should ask the manager of the Aman Tokyo for some tips :P). It’s not really the sloppy service or the tourists roaming around the property/beach ever so often. And despite the fact that I didn’t like the general configuration of the rooms, it’s not really that either. It’s rather the fact that a luxury hotel is a concert of so many small things that, when put together, become grander than each part seen by itself. And while most properties will put a different emphasis on different details, the result should always be something harmonic. 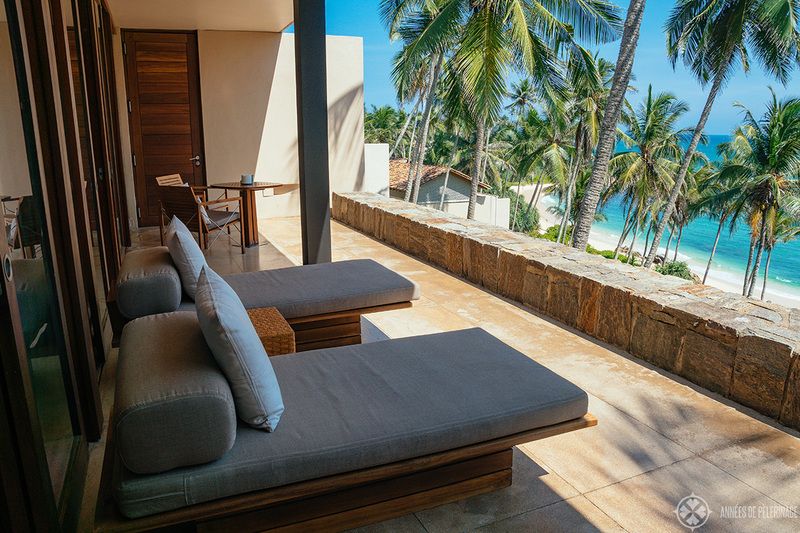 Amanwella sadly produced only a discordant sound – despite the lush breeze constantly caressing its red-tiled villas. The be fair, the property itself and the cove beyond it out of this world. It was the very reason why I wanted to stay there and in the end, and I did not regret it. But it also didn’t feel like 1,000 USD a night awesome either. I think most of the things I criticized are actually quite easily remedied and I got the feeling the new manager will start oiling all those rusty cogwheels one after the other. A little upgrade to the rooms here, a bit of tweaking at the beach club there, a bit of coaching for the waiters, and maybe even a traditional dance show once a week. Who knows? 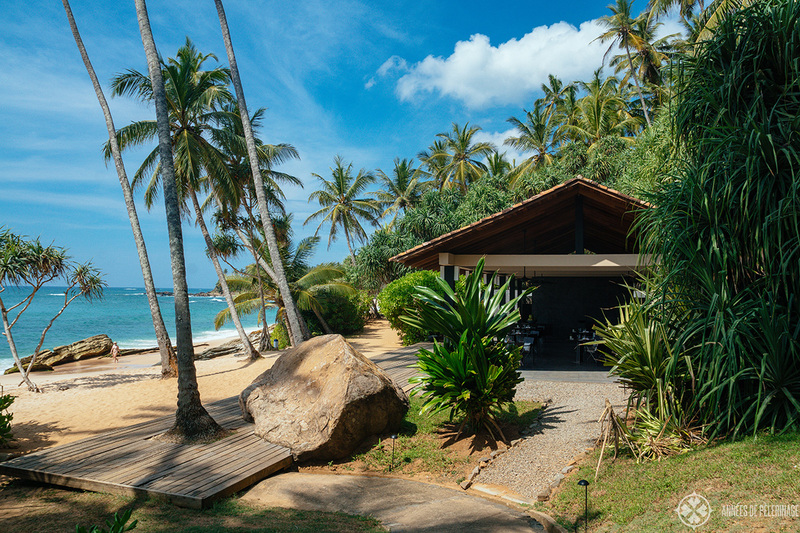 Once the engine starts roaring again, I’m sure it will rightfully take back its place as the best beach hotel in Sri Lanka. 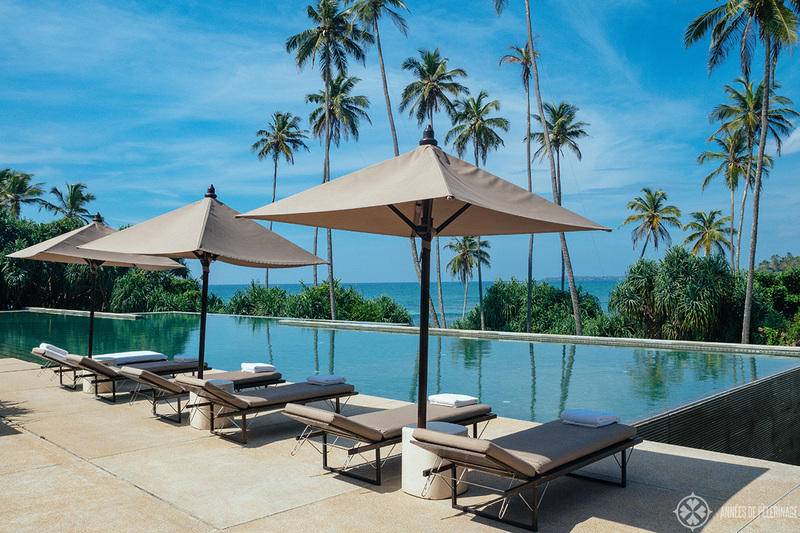 So, this was my honest and unsponsored Amanwella review. Got any questions? Feel free to ask them in the comments below.